After decades of struggle, we Americans are slowly finding some sense of maturity on the issues of race and culture. The news today would have you believe that the truth is far from that statement, but the news today is not interested in positive stories. Our journalism and politics, two animals living in symbiosis, are interested in the lowest common denominator. While we Americans may be largely moving past overt racial hatred (as a whole), we are certainly still able to display tremendous racial and cultural ignorance. The recent debates over immigration and the Cordoba Center in Lower Manhattan crystallize the methods and reasons we see operating in politics and the media. Political figures or pundits are allowed, encouraged even, to make fallacious statements about a given issue. Media outlets then report on those statements over and over again until, eventually, the original reporting is used as source material for later work. Attempts to interject fact into a debate are ruthlessly suppressed by politicians with a point to make and media outlets with reputations to preserve. When facts can’t be suppressed and are eventually debated in the open, the politicians and pundits change the terms of the argument. It is the subtle and evil genius of our politics today, that arguments are rarely debated until a rational conclusion is reached. As an example, the Cordoba Center was first attacked as an insult to 9/11 victims; a mosque being built at Ground Zero, the horror! When sensible folks pointed out that the project was, a) not a mosque and, b) not at Ground Zero, the argument was modified. Now, it was in the neighborhood of Ground Zero, and its mission of outreach was insulting to the victims of a so-called Islamic crime. As religious leaders, responsible politicians, civil libertarians, and New Yorkers weighed in on the issue in support of the project, the debate was shifted. We shouldn’t defend the project on the grounds of religious freedom, we were told, because Islam wasn’t really a religion. And so it goes; the argument has been massaged and renovated until it finally touched a nerve more primal to Americans than liberty…fear. The fear of Islam, in the aftermath of decades of extremist acts by self-centered pretenders using Allah as a shield for their excess, is palpable in our nation. The irony that a religion which traces itself back to Abraham and Moses, just as Judaism and Christianity do, can be thought of in such terms is painful indeed. Painful, and yet wonderfully convenient for the conservative mainstream media. Winning elections is always about identifying the villain. But to get to that villain, the producers of these virulent strain of hate had to first to America’s eye off the ball. The strategy of that subtle and evil genius is absurdly simple; if it were tried in any other endeavor, Americans would have none of it. Imagine a football team who, when denied at the goal line, simply announced that a touchdown could be scored by running out of bounds. When that strategy is matched to areas that prey on our fear for our family’s safety, or the pain caused by the cultural loss related to immigration and neighborhood change, the ultimate utility of the lowest common denominator is realized. The saddest of a wealth of sad outcomes of this political/media tool, is that the manufactured cultural ignorance of the story becomes the real cultural ignorance of the population. We Americans internalize the information we receive from sources we have come to trust. Once inside us, they form a perception that resits both logical argument and appeals to rational thought. Once we are told enough that Islam is a threat, we begin to act in ways that alienates practitioners of the religion. Alienation leads to misunderstanding. Misunderstanding leads to conflict. Conflict leads to hatred. Islam as a threat becomes the self-fulfilling prophesy. It is the same vicious cycle that we have endured within racial debates; the same cycle we endured with the million of uninvited immigrants from Ireland, Eastern Europe, and Italy after the turn of the 20th Century; the same cycle we endure with today’s immigration debate. None of this imagines that there is no threat from Islamic radicals. None of this imagines that there is no threat from Muslims in the United States. 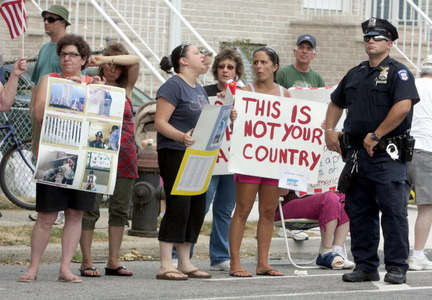 None of this prejudices the real struggles of citizens who have seen their communities changed by illegal immigration. The simple statement of this essay, is that the facts and humanity of these stories are more relevant, important, and compelling than the fantastical etchings of a crooked media and punditocracy. The value of an inclusive democracy is that that blending of talents leads to a whole far greater than the sum of its parts. America’s greatness is found in the rising above the lowest common denominator.